Today, I have had a day off. I have watched all three episodes of the spooky Remember Me that I recorded last November and haven't yet had time to watch, plus a film. I spent 4 hours chattering in a cafe with an old PGCE student who's moving to Dubai. I visited the supermarket in person, instead of quickly doing an online order of all things I have previously ordered because I'm too busy to browse for new food. And I have knitted. A LOT. I know this is over-exaggerating, because I am very good at not working on Saturdays and I did have Wonderwool weekend not so long ago, but today feels like the first day I have had actually not working or with a deadline hanging over me since January. It has been an epic few months. I had a deadline for a piece of writing today; last weekend I was working on assignments for the exam board course; the weekend before I was presenting at a history conference; the weekend before was all Y13 and Y11 coursework marking; the weekend before was Wonderwool and worrying about all the work I had to do and when I was going to do it and coming home and working all Sunday evening; I can't remember the weekend before that but I do know that I was too busy to adequately prepare the ski trip video. The weekend before that I was in London for a course, and the two weekends before that was skiing. And you might remember March. And the revision! Oh, the revision. Three after-school sessions a week. A parents' workshop. I'm going in next Sunday for the last gasp with Y11. And also Ofsted came back for an unannounced follow up to their January visit. They didn't see me, but it just added to the melee that was term 5. So, today has been a bit weird, really. I've been drumming my fingers and fidgeting and constantly wanting to get up and come upstairs to do work. I have work to do, but thankfully none of it is particularly arduous or pressing. Tutt keeps reminding me that I like hard work; she is right. But, damn. This is starting to get silly. On the plus side, I did get to meet Lucy Worsley whilst at the history conference. 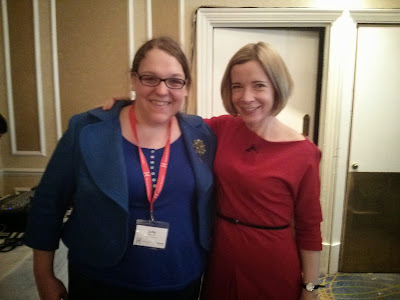 Lucy Worsley! I was star struck. I was chattering to a co-presenter when she walked past and we went and hung around until one of us (him) managed to pluck up the courage to ask for selfies. Her lecture was very funny: showed us a picture of her trying on the crown jewels and told us a good secret about how they figured out the anniversary of Hampton Court is 2015. I'm taking it to the grave Lucy, I swear. More blog posts to follow, of course, now that I am temporarily free of deadlines. I've got two weeks until marking starts so I am hoping to make the most of it. The publisher has already opportuned on my brief window of time between the end of marking and the summer holiday - a period of roughly two weeks. So, it's nice to be in demand and stuff, but, come on.